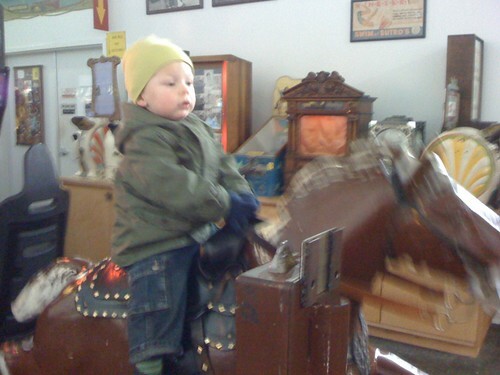 Horsey Ride = 25¢, originally uploaded by pseudobunny. I love the Mechanical Museum....And duh! We catch the 21 to Market Street then transfer to the street car (which BONUS is a fun train ride for Osky) and it drops us off nearly right in front. Plus there is an In&Out Burger Joint and all kinds of sight seeing down there. Next time I am bringing someone so I can have some crab. Yum. Who is down for some adventure? i'll fly in for some lunchlady adventure!